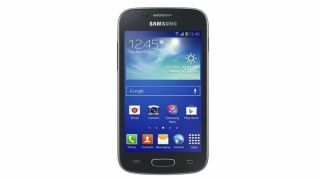 Samsung's slipped yet another member of the Galaxy family our way, the Galaxy Ace 3, which lands exactly as we expected it to and in both 3G and 4G LTE forms. The 4-inch 480 x 800 display is your first hint that this is pretty entry-level as far as Samsung handsets go. The phone will be running on a 1.2GHz dual-core processor with 1GB of RAM. The handset's 5MP camera is accompanied by an LED flash, with Samsung also packing in a load of nifty new features, including S Translator and S Travel, which provide translations and travel information wherever you are. Obviously. It's also nabbed the Smart Stay feature of the Samsung Galaxy S3, which is intended to help extend the life of the battery by monitoring your eyes and shutting off the display when you look away. Dimensions-wise, the Ace 3 comes in at 10mm thick and weighing 119.5g, with a 1800mAh Lithium-Ion battery under the hood. And good news for OS-fans: the Galaxy Ace 3 is running Android 4.2 Jelly Bean. However, there's only 8GB of storage, and Watchdog-fearful Samsung tells us that of that space only 5GB is user-accessible. The good news is this is expandable up to 64GB via microSD. Samsung hasn't confirmed anything on date or price, but we expect to find out more at its June 20 launch event.